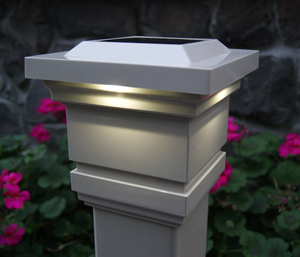 The Classy Solar Post Cap is engineered to provide up to 12 hours of solar light every night, while exuding a traditional, classy look by day. The 4 high output LEDs cast a brilliant white light downward onto the outside walls of the post cap creating a captivating ambiance. Designed to fit an existing 4" x 4" existing post. 5" by 5" White Adapter for Classy Solar Post Caps. 3.5 x 3.5 Tan Adaptor for Item Codes- SL074, SL078, CC044. 3.5 x 3.5 White Adaptor for Item Codes- SL074, SL078, CC044. Received quickly, installed easily, and they look great! These lights fit my front step posts just as they were advertised. The lights changed the appearance and gave me more light for my steps landing .